More than just a beach destination, the city of Virginia Beach is a vibrant, year-round coastal community with thriving arts and culinary scenes, a rich history, and a wide array of family-friendly entertainment options that keep residents and visitors living happy, healthy lives. Nearly a half a million folks call VB home, and over 15 million people visit each year. While the beaches along the Oceanfront support popular shopping destinations, restaurants, and attractions, there are also secluded parks and protected beach areas that offer a welcome respite from all the excitement. The eclectic ViBe Creative District celebrates artistic expression and Town Center provides another nexus for entertainment and shopping away from the beach. The Virginia Beach area was first inhabited by the Chesepian Native American tribe prior to the arrival of English settlers in 1607. The Chesepians also had two villages and it is confirmed that one was located in the present Great Neck area of Chesapeake, Virginia. Three ships commanded by Captain Christopher Newport consisted of 105 men and boys and was sponsored by a division of the Virginia Company. The site of their "First Landing" is within the boundaries of the Virginia Beach’s Navy’s Joint Expeditionary Base East and First Landing State Park was named to commemorate this event. Locals are fond of Virginia Beach’s great outdoors, as well as arts, history, sporting events, and a wide variety of entertainment. Mount Trashmore Park is one of the iconic parks with two man-made mountains, two lakes, two playgrounds, a skate park, and many walking paths. Athletes also enjoy the Virginia Beach Field House. Notable attractions range from the Virginia Museum of Contemporary Art to the Virginia Aquarium & Marine Science Center, which also offers Whale Watching Boat Trips during the winter and early spring. For history buffs, the Cape Henry Lighthouse is a must visit. Also, many structures from the Virginia colony still exist. Some of them include the Adam Thoroughgood House, Old Donation Episcopal Church, and Francis Land House. Autumn and winter are never dull in this beach town. Drive your family through a 20-year-old Oceanfront tradition, the Holiday Lights Maola Milk Merry Mile. Southeast Tourism Society’s named the tradition “Top 20 November Events!” And while you are at the Oceanfront, make sure to visit the King Neptune statue, built in honor of the Neptune Festival, which is held each September. Universities and trade schools abound in Virginia Beach and the area is home to a number of military bases including the Naval Air Station Oceana as well as numerous support contractors. Virginia Beach’s proximity to some of the east coast’s largest ports has drawn hundreds of international corporations to set up operations. Many global companies base their North American headquarters here including STIHL, Bush, and IMS Gear. Meanwhile, more than 100 farms operate in the area with many of them selling their products and produce at the city’s Farmers Market. The hospitality industry is also strong in the area with TripAdvisor listing over 150 hotel properties. Yelp lists over 1,200 restaurants in Virginia Beach and the VB Restaurant Association (dineinvb.com) is a good place to start when looking for a great meal. Captain George’s Seafood Restaurant is known for its all-you-can-eat seafood buffet. If you’re in the mood for some barbecue, look no further than MISSION BBQ. Waterman’s Surfside Grille has been a local favorite since it opened its doors in 1981. Local seafood is great here, but they are known for their famous “Orange Crush” beverage. 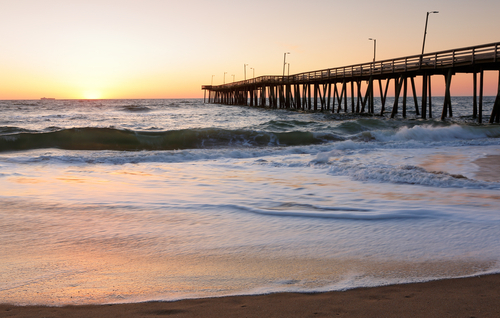 Whether you call it Coastal Virginia, Hampton Roads or Tidewater, we hope that you will call this region “home”. Let us help you find your home here.